Budding level designer Matt Bradley is off to a good start with "DM-Spectrum," a deathmatch map for Unreal Tournament 3 that's unlike anything we've seen for the gib-laden shoot 'em up. DM-Spectrum, writes Bradley, is designed on a concept that forces UT3 players to use the game's spectrum of lighting to navigate and kill opponents. 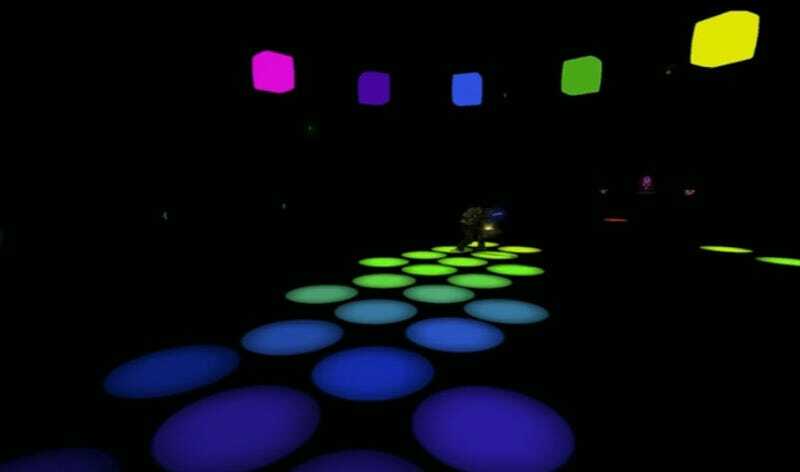 Disco floor lighting highlights a player's current position, with seven cubes of lighting giving other players a global peek at where opponents are on the map. "Each coloured cube represents a different area of the map," Bradly writes. "When a player is in one of these areas the corresponding cube lights up notifying other players. As one learns the map they should be able to find enemies without to much hardship." A trailer is after this. According to Bradley, DM-Spectrum also uses curved walls to prevent players from getting stuck in corners, with white track lighting indicating the borders of the level's three platforms. That auto-generated soundtrack you're hearing in the trailer may not be reflective of the custom level's audio capabilities. "I had intended to add a REZ style layered soundtrack but was foiled by a lack of programming and UnrealEd knowledge," Bradley says. "Maybe I will take some time to learn because I think it would have considerably added to the level. Subverting traditional playstyles further by forcing the player to use the audio to navigate."